A fine early 19th Century British Old Master oil on canvas painting attributed to Abraham Cooper RA. The work depicts Launcelot, a beautiful bay horse with a white splash on his nose, in a stable, being watched by a cat. 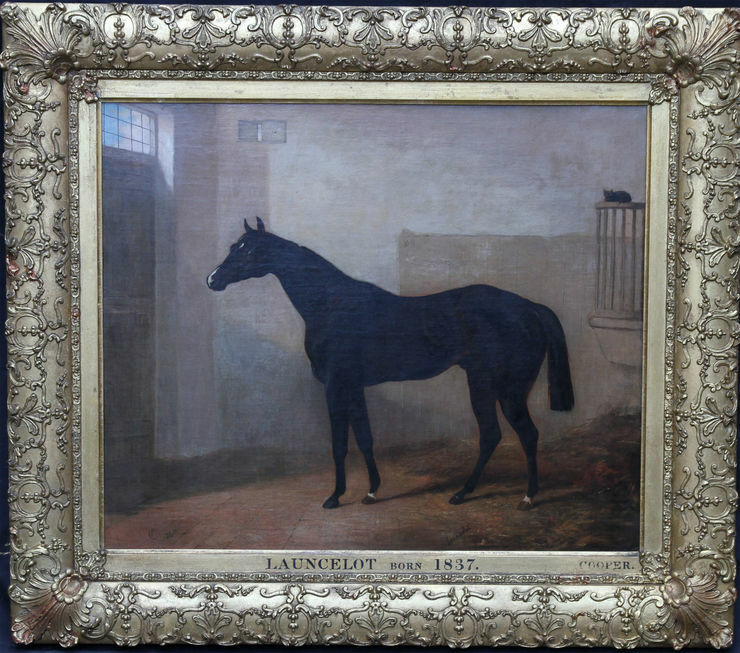 On the frame it states 'Launcelot born 1837 Cooper'. The oil painting bears Abraham Cooper's monogram and the date 1840. It also bears horse's name Launcelot. Housed in its original ornate frame in good conditon. According to a typed label on stretcher, purchased in 1841 by Robert, 1st Marquis (of Westminster 1767-1845) from the artist for £21; located in 'The Duke's Sitting Room, Eaton' (Eaton Hall is the Cheshire seat of the Duke of westminster); purchased in London by the owner's father. Framed in a fine gallery frame 34 inches by 30 inches. In good condition. Abraham Cooper RA (1787-1868), was an English animal and battle painter. The son of a tobacconist, he was born in Greenwich, London. At the age of thirteen he became an employee at Astley's Amphitheatre, and was afterwards a groom in the service of Henry Meux, a brewer and later the first of the Meux baronets. 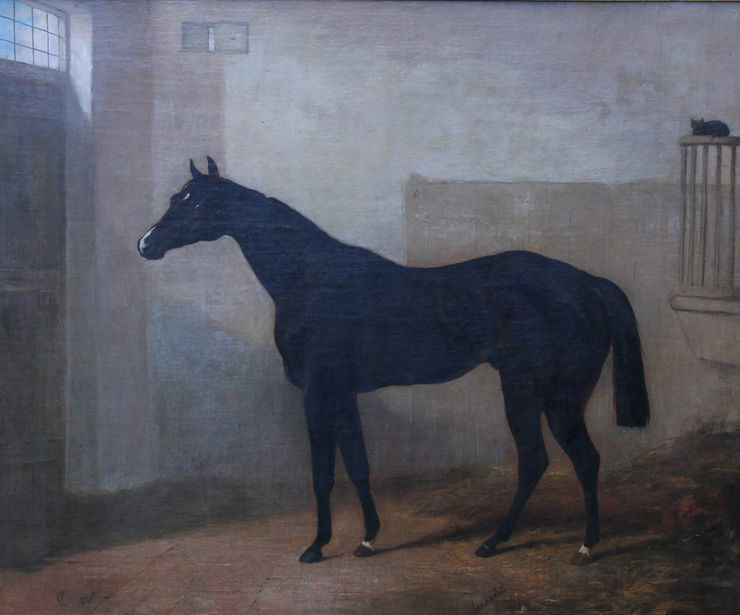 When he was twenty-two, wishing to possess a portrait of a favorite horse under his care, he bought a manual of painting, learned something of the use of oil-colours, and painted the picture on a canvas hung against the stable wall. His master bought it and encouraged him to continue in his efforts. He accordingly began to copy prints of horses, and was introduced to Benjamin Marshall, the animal painter, who took him into his studio and seems to have introduced him to the Sporting Magazine, an illustrated periodical to which he was himself a contributor.